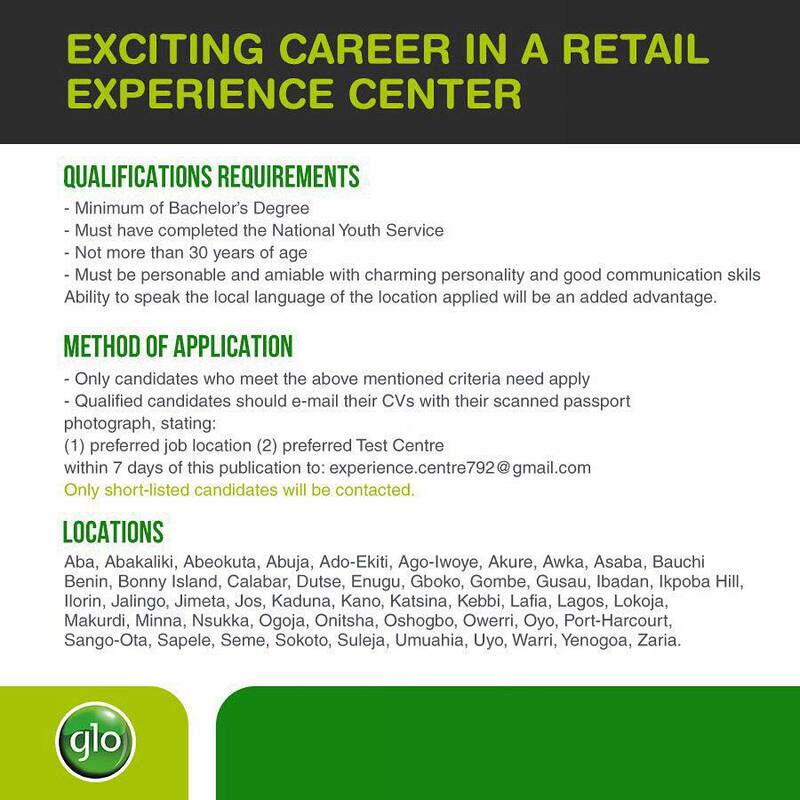 EXCITING CAREER IN A RETAIL EXPERIENCE CENTRE!!! Are you a young, charming, confident and intelligent person who is interested in building a career in a Retail Sales and Customer Services outlet? Then, this opportunity is for you. QUALIFICATIONS/REQUIREMENTS: • Minimum of Bachelor’s Degree. • Must have completed the National Youth Service. • Not more than 30 years of age. • Ability to speak the local language of the location applied for will be an added advantage. Aba, Abakaliki, Abeokuta, Abuja, Ado-Ekiti, Ago-Iwoye, Akure, Awka, Asaba, Bauchi, Benin, Bonny Island, Calabar, Dutse, Enugu, Gboko, Gombe, Gusau, Ikpoba Hill, Ilorin, Jalingo, Jimeta, Jos, Kaduna, Kano, Katsina, Kebbi, Lafia, Lagos, Lokoja, Makurdi, Minna, Nsukka, Ogoja, Onitsha, Oshogbo, Owerri, Oyo, Port Harcourt, Sango-Ota, Sapele, Seme, Sokoto, Suleja, Umuahia, Uyo, Warri, Yenogoa, Zaria. Shortlisted candidates would need to sit for an Aptitude Test, which would be held in these Test Centres:- Abuja, Jos, Port Harcourt, Benin, Kaduna, Enugu, Ibadan, Lagos. *A token may be considered as transport allowance for shortlisted candidates coming from outside the test location only. Only candidates who meet the above mentioned criteria need apply. Kindly Submit your Application before 19th December, 2017.